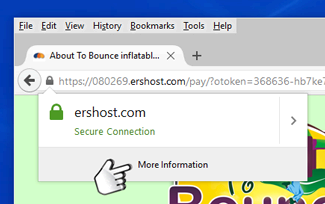 Our customers that use abouttobounce.com to reserve their favorite party rental equipment can rest assured their personal and credit card information is protected by the best encrypted secure socket layer technology from Go Daddy Inc.
As you begin the checkout process you will be asked to enter your name and address information. The next page will ask for your event information. At this point, should you choose to not complete your reservation, none of your entered information is saved. After the event information you will be directed to the payment page for your credit card and payment info. It's at this time you enter the secure area of the website, or what is known as the secure socket layer. Once you submit your reservation all the information is saved to your order and is transmitted to About To Bounce via this encryption process. Your information is safe with us. 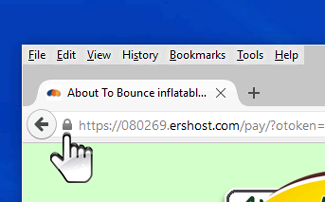 Click the lock on your browser address bar when you enter the payment page. Click on "More Information" for complete certificate details.